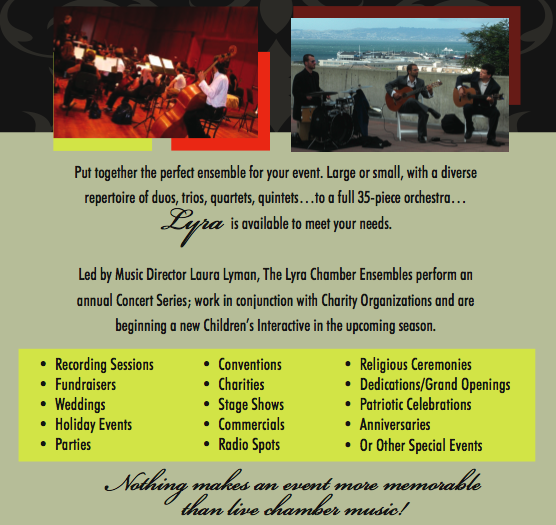 The Lyra Chamber Ensembles offer a range of musical groupings to meet the needs of any project. Whether it be a film score, live performance or commercial recording we can bring your event to a higher level. From a strolling violinist or a trio of your favorite instruments at a wedding to an entire Chamber Orchestra for your radio spot– ﻿this professional group of musicians will tailor a unique performance for your event... adding a touch of elegance to any occasion and a level of excellence to any project.